(Penguin: cloth, 51 pages, $17.99). got the vernacular down good. And, as usual, the illustrations are half the fun. summah came on Tuesday!” The other adds, “Went on Thursday!” Aiyah! versions, but Tomie’s takes the pie. ...this heyah rich lady...drivin’ ‘round the hills of Vermont to look at the fall folige. chauffeur to ask a “fahmah standin’ by his fence” if he knows the time. 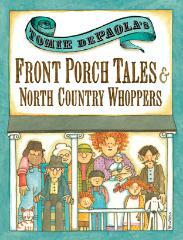 Front Porch Tales & North Country Whoppers is a beaut. Tomie dePaola admits to being a transplant from Connecticut. it right down pat in these good, old stories. By gawd, the man could almost pass for a native. Writers Project award for fiction.